Two weeks ago I wrote about two great sake resources I discovered in Amsterdam. Places with a selection of different quality sakes, where you can get advice and pick up a good bottle of sake according to your own preferences. Turns out there is more good sake available in Amsterdam! The first source came up in the comments of the previous post: Restaurant Yamazato in the Okura hotel has an extensive sake list (pdf), including an organic junmai ginjo and several daiginjo. The Okura is also planning to offer sake tasting workshops as part of its Taste of Okura cooking classes, although no dates have been announced yet. And I got even more excited when I discovered that my favorite wine shop, Ton Overmars, had started carrying a selection of sakes! I went there last weekend to pick up some bottles of Tempus Two and immediately spotted the new sake section above the port and cognac. 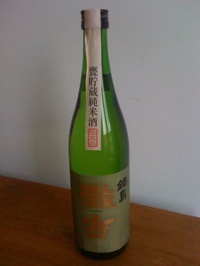 Ton now has 15 kinds of sake available, complete with classification and some descriptions. What was even better was that Ton spotted me checking out the sake and was nice enough to not only help me make a selection but let me taste five kinds right on the spot! Apparently I had just missed one of his memorable tasting evenings in the neighborhood church. And luckily there were some bottles of sake left open and ready to be tried. I settled for a bottle of Sake Nabeshima Chõko,which is an unpasteurized junmai with a complex aroma and a very smooth structure from aging. Ton also has the Kizan I got some time ago at the Pure Markt, as well as some specialties like a reddish colored sake, a bottle with active yeasts and a 31 year vintage sake! If you are into sake, you should definitely check out Ton Overmars on Hoofddorpplein in Amsterdam!